THE URBAN HOUSE: Townhouses, Apartments, Lofts, and Other Spaces for City Living take readers on a trip around the globe, well almost. This unique volume explores some of the most innovative and eclectic residential designs located throughout the world. With twenty-five new and more recent spaces for living, THE URBAN HOUSE becomes a lyrical journey through some of the most captivating apartments, lofts, townhomes, and other living spaces located in some of the most magical cities in the world. 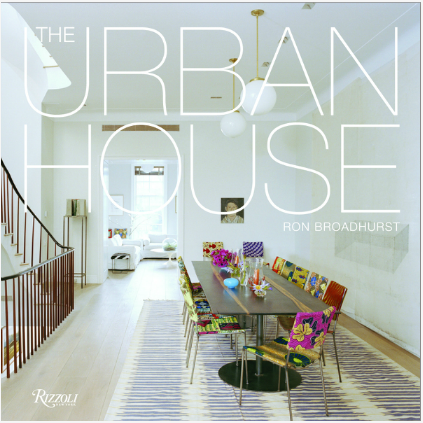 Renowned author of Houses: Modern Natural/ Natural Modern and Next Houses: Architecture of the Twenty-First Century Ron Broadhurst presents Urban House, a tome showcasing stunning, avant-garde designs and architecture from all over the world. In writing this volume, Broadhurst spotlights modern design ideas prevalent in our world today that will have a profound impression on city living in years to come. Urban House introduces twenty-five novel places to live that would make to-die-for homes to say the least. Not only does this volume display innovation in style and design, but Urban House also presents an array of sophistication in architectural materials that promote for example, environmental stability. Design connoisseurs Andrée Putman, Annabelle Selldorf, and Richard Meier in collaboration with the incredible talents of Messana O’Rorke and Barbara Bestor help to make this book the most sought-after volume of residential design. With that being said, what’s not to like? We love this book and it is available at Rizzoli New York and at http://www.rizzoliusa.com for $45.